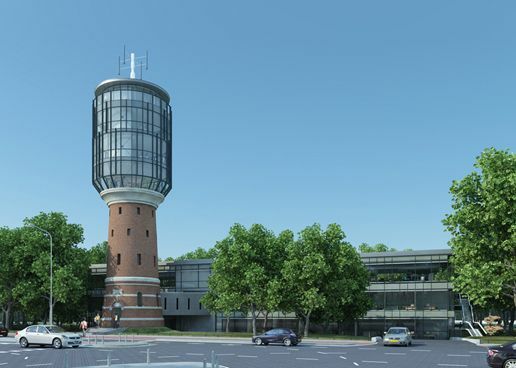 Transformation of a water tower, Bussum (Architects: Vocus). Starting this year the government in the Netherlands intends to only purchase sustainable products and services. This will include construction and the management of buildings. City and local councils are aiming for 75% in 2010 and 100% in 2015. The Provinces and Water Boards are setting the bar at 50% in 2010 and 100% in 2015. The authorities hope to stimulate the availability of more sustainable products and services by means of sustainable procurement. Office building new construction (this criteria document can be found under downloads). The government will spend around 700 million euros on the new construction of office buildings. The government can impose requirements on both the environmental performance of the buildings as well as on the designers and suppliers of building materials. The requirements for the environmental performance of the building are to be determined using the software package Greencalc+ or with the web application ‘GPR Gebouw 4.0’. The government will inform bidders in advance which tool they should use. When Greencalc+ is used a minimum score of 200 must be achieved; for ‘GPR Gebouw 4.0’ a score of 7.0 is required.